James Bond, Great Britains most famous spy, is an alcoholic, according to Kim Painter in USA Today. 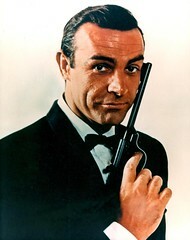 Painter notes that women, gun fire and spy threats are the least of Bonds worries. Whats more likely to kill him? Alcohol. Based on research completed this year and published in Britains Journal (BMJ), James Bond drinks more than four times the amount recommended for British men, and doctors suspect James Bond would have shaky hands, sexual problems and a life expectancy of about 56. What else can James Bond expect? According to BMJ, James Bond can also expect to suffer from liver damage, stroke, early death and a higher probability of getting into a drunk driving accident than other drivers. Patrick Davies, co-author of the James Bond study suggests that there are some individuals who can drink this amount of booze, "But they are not capable of drinking that amount and still being able to defuse a nuclear bomb." Although the James Bond study done by Britains Medical Journal is funny, there are many alcoholics who have a serious drinking problem and continue to drink and driver, get arrested, get punished and then do it again all over again. For instance, the Texas State Attorneys office notes that in 2012 there were 50 current and and recently convicted defendants had at least three prior DUI convictions but still got behind the wheel and were arrested again after having had too much to drink. The number in Florida was high too. In fact, in 2012 there were over 22 drivers in that state that had more than three prior DUI convictions. Each of these cases is an example of drivers who have what one state attorney called a blatant disregard for the law. Even though the severity of DUI laws has increased over the last 10 years, some drivers dont care and the laws are not enough to stop them. Florida, for instance, allows for prison terms of up to five years for anyone on his third DUI offense in a 10-year period. Other states have a life-time license revocation or do not allow a DUI conviction to be expunged from a drivers driving record. But it does not seem to be enough. Critics of the current DUI laws argue many drivers who continue to drink and drive may be alcoholics. Thats why many groups who are fighting against drinking and driving have increased their push to make rehabilitative treatment part of the penalty for drunk driving. Others note that throwing a person in jail over and over again isn't going to do any good if they are an alcoholic. They will simply get out of prison and go have another drink. Does James Bond glamorize Alcohol in the Media? Some critics also believe that glamorizing alcohol in the media is a mistake. Weve vilified cigarette smoking in the media and in society- why not drinking too much? Arguably, it causes more damages to families, individuals and other drivers. No matter how glamorous James Bond makes it look.